Ruby Waghorn has become an internet hit after her Love Island impressions video has gone viral on Facebook. The video shows Ruby doing hilarious impressions of the stars of the popular ITV2 reality show and has got thousands of views on the Facebook page Love Island Reactions. Ruby perfectly mimics the mannerisms of the stars which include Olivia Attwood, Kem Cetinay, Camilla Thurlow and Amber Davies. In the video Ruby first tackles Amber. I don’t want Kem to go for Tyla because he never cut my hair. There’s no one else in the villa I would go for, that’s the thing. Hundred per cent on paper she is my type. I just don’t want to get mugged off. It’s doing my head in if I’m being honest. In the video she also reels off many off the islanders famous catchphrases such as ‘mugged off’ and ‘cracking on’. 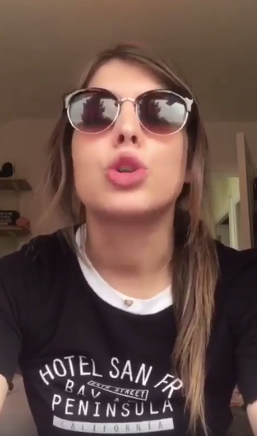 Fans of the television show applauded Ruby’s video on the Facebook fan-page. One user commented ‘how good is she’ whilst another put ‘too accurate’. We think that they are hilarious. You go girl!